If humans do someday live on the Moon, they're going to need some place to live. Rovers may soon traverse the surface of the Moon yet again. This time, though, they’ll have one noble mission: to build shelter the first human colonizers will inhabit. A team of Japanese scientists is working to make this a reality. They started a company called ispace with the intention of launching a private space mission to the Moon. ispace envisions an entire colony, called “Moon Valley,” constructed not by human astronauts, but by robots instead. And they want to get started on it soon: the team is planning its first mission for late 2019, and a second in 2020. The Moon is smaller than our other planetary neighbors, but it could become a second home for an exponentially growing human population back on Earth. But many, including Elon Musk, see the Moon as a stepping stone (or even just a place to stop for gas) to future space colonies on more distant planets, like Mars. The team’s 8.3-pound lunar rover is shaped like a metallic beetle and is designed to house tools and instruments its clients may want (the company’s web site is strangely vague about what these may be, and what purpose they might serve). It also was designed to extract valuable resources that could later be used to build a city on the Moon. The team initially conceived of the project, at first dubbed “Sorato” (“white rabbit”), three years ago, as they planned to submit it to Google’s coveted Lunar X Prize, Wired reports. But the X Prize Foundation has been pushing back its deadline for years. It was supposed to be 2014 originally, but after years of delays, it dissolved the prize this past January, since none of the finalists could meet Google’s ambitious deadlines. That doesn’t seem to be fazing ispace. With a healthy $90 million in its first round of funding late last year (even SpaceX only raised $61 million in its first round, back in 2002), its effort to launch a private mission to the Moon no longer seems far-fetched. But ispace isn’t the only company with ambitions to use robots to construct a new home on the surface of the Moon. The Pacific International Space Center for Exploration (PISCES) managed to build a four-wheeled robot that’s capable of building a landing pad for future space exploration on the Moon. It hasn’t done so, at least not yet — it’s only been tested in Hawaii under conditions that are decidedly Earth-like. 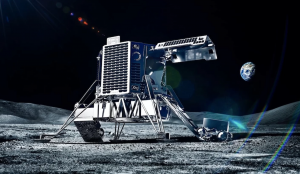 Other efforts, including one mission proposed by the European Space Agency, will test if local lunar soil could be used to 3D print a lunar base. By combining loose soil with special salts as “structural ink,” robotic 3D printers could one day build dome-shaped shelters that could house the first space explorers on the Moon. MIT researchers created a competing project that looks particularly promising — last year, they 3D-printed the entire basic structure of a 12-foot high building in just 14 hours, with the help of a large industrial robotic arm. This “Digital Construction Platform” could build structures in remote places such as Antarctica first, and perhaps eventually on the Moon, or even Mars. But who’s going to start building on the Moon first? NASA just canceled its only existing Moon Rover Project, and chances are, we’ll have a solid 4G phone connection on the Moon, before we start actually living there. Private space companies might be a safer bet: SpaceX has big plans to build its own bases on the Moon, and eventually Mars, with the help of its BFR. Other companies, from Blue Origin to Moon Express, have already indicated they’re in the race, too. It’s anybody’s guess when, or if, humans will call the Moon their home. But what is clear? It’s a pretty good idea to have robots build us a shelter first. And for that purpose, ispace seems to have a pretty promising candidate.